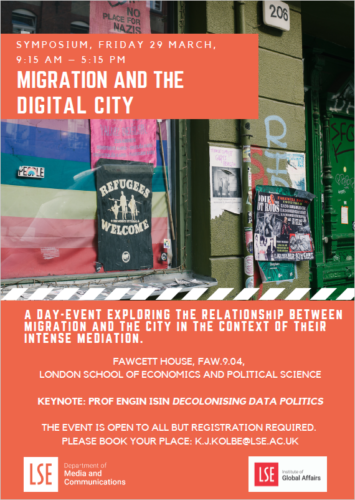 I took part in the closing panel of this symposium at the LSE with Deena Dajani and Marcia Chandra, reflecting on the possibilities and challenges of cross-sector collaboration, especially with regard to the City of Refuge project. Joining us were Koen Leurs and Katja Kaufmann who also presented papers on their work with migrants and refugees. It was a good moment also to reflect on how so much of my work hinged on a meeting I had almost exactly 19 years ago, in the Spring, with Professor Roger Silverstone at the LSE. From that meeting we went on to establish the SoMa (Social Matrices) think tank for culture – a groundbreaking collaboration between the LSE, the RCA (where I was a Research Fellow) and Proboscis. Roger’s support and trust in me and my idea that we could create new research trajectories through transdisciplinary collaborations has borne much fruit over almost two decades; and in this latest collaboration I think he would have been pleased to see another risky project realised with sensitivity, commitment to our participants and partners, and its results beginning to have effect in the wider world.